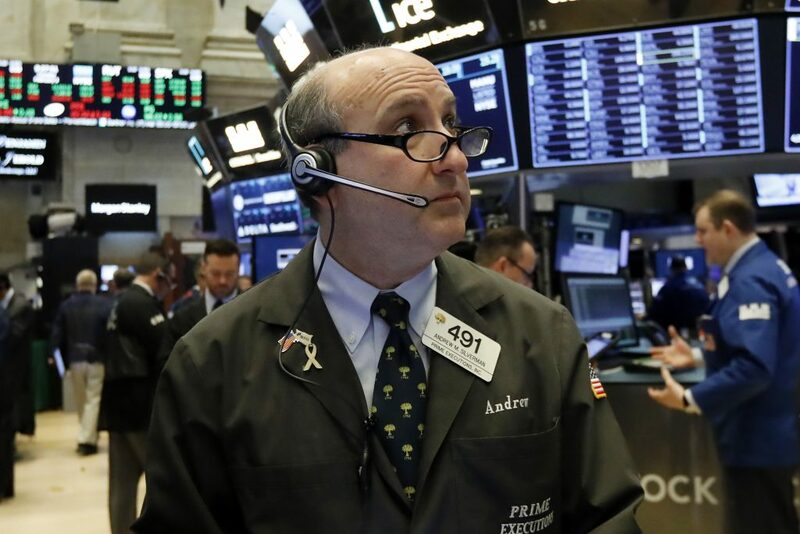 U.S. stocks slumped in late-afternoon trading Thursday as pessimism built about the strength of the global economy and corporate profits this year. The sell-off followed a slide in overseas markets after European officials slashed their forecast for economic growth in the euro zone this year and the Bank of England warned that the British economy is set for its weakest growth in a decade. They’re the latest flashpoints of worry as investors gird for predicted slowdowns in economies around the world, including the United States. In U.S. markets, sharp drops for Twitter, apparel company Tapestry and energy stocks helped pull the S&P 500 index lower. The benchmark index broke a five-day winning streak on Wednesday. Twitter gave a better-than-expected earnings report for its latest quarter, but its stock price tumbled after it said revenue for this quarter may fall short of some analysts’ estimates. KEEPING SCORE: The S&P 500 fell 1.3 percent as of 3:26 p.m. Eastern time, and was on pace for its worst day in more than two weeks. The Dow Jones industrial average lost 289 points, or 1.1 percent, to 25,100, and the Nasdaq composite slid 1.5 percent. Major European indexes also fell sharply. THE QUOTE: “We’ve come so far so fast that people were just looking for a chance to be able to say, ‘Yeah, that’s it, I’m going to take some money off the table,” said Tom Martin, senior portfolio manager of Globalt Investments. ECONOMIC WORRIES: European stock markets tumbled after the European Union’s commission slashed its forecast for economic growth in the 19 countries that use the euro this year to 1.3 percent from an earlier forecast of 1.9 percent. A weaker-than-expected report on industrial production in Germany also raised concerns. In London, the Bank of England cut its forecast for growth this year to 1.2 percent from an earlier forecast of 1.7 percent. That would be its slowest growth since 2009, and the bank said it sees a one-in-four chance of slipping into a recession this year. In the U.S. meanwhile, a report showed that the job market remains strong as fewer Americans applied for unemployment benefits last week, a sign that layoffs are low. But many economists expect the U.S. economy to slow this year as well, along with economies around the rest of the world. Other social media companies also fell. Facebook dropped 2.7 percent. IN A HOLE: Dunkin’ Brands fell 3.3 percent after the doughnuts chain gave 2019 guidance that fell short of what analysts were expecting. NOT A GOOD LOOK: Shares in Tapestry tumbled 14.6 percent after the owner of Kate Spade, Coach and other luxury apparel brands reported quarterly earnings and revenue that missed Wall Street’s estimates. EARNINGS WORRIES: It’s not just Twitter that investors are getting concerned about. Across the S&P 500, analysts are forecasting earnings per share to drop 1.8 percent in the first quarter from a year earlier. They were calling for growth just a few weeks ago, and if the updated forecasts prove true, it will be the first decline in nearly three years. INTEREST RATES: All the concerns sent investors toward Treasury bonds, which are seen as safer investments during tumultuous times. When a bond’s price rises, its yield falls, and the yield on the 10-year Treasury note fell to 2.65 percent from 2.69 percent late Wednesday. TRADE TALKS: Stocks around the world have heaved up and down recently on concerns about U.S.-China trade tensions. Treasury Secretary Stephen Mnuchin and trade representative Robert Lighthizer will lead a delegation to Beijing next week for the next round of trade talks, but the issues are complex. These include contentious topics like Beijing’s technology policy and trade practices, where progress has been limited so far. ENERGY: Benchmark U.S. crude oil dropped 2.5 percent to settle at $1.37 a barrel. Natural gas slid 4.2 percent. That helped drag energy stocks in the S&P 500 down by 2.3 percent, the worst decline among the 11 sectors that make up the index.